Sam got his grades yesterday. All A's and B's, with generally positive comments from his teachers. We ended up having to buy a math workbook for $50, since the last one vanished mysteriously. I'm taking him to school today in order to get his bike there for his biking class. Sam got his classes yesterday: math, Cultural Connections, Life Science, Ancient Civ, choir, Healthy Choices, Bicycling, and Fitness. Having two exercise classes was a bit of a surprise, and he thought he'd want to change one initially. During dinner, he then reported that his cycling class was the most fun, so he's going to give it a try. I got out all his bike gear and we'll haul it to school tomorrow. I'm heading back to work momentarily, a few moments of quiet between getting dishes done, kitchen cleaned, kids fed, lunch made, and driving off to read the email that has built up at work. It's been a great vacation, the longest I've had in a very long while. The end of last week was very low-key. I spent two days fighting zombies with Sam, and generally taking it easy. Emma arrived with a bit of a cold Thursday night. Sam left Saturday morning to his mom's, and returned Sunday afternoon. We did a library run on Saturday. I played D&D with Jason, BJ, and some old friends Saturday afternoon while Emma and my mom hung out. Sunday we picked up a plumb tree and I planted it in the rain with help from kids. Much Minecraft was played, with Sam starting work on an arena. We plan archery contests and a pig riding race. Yesterday Joanna went to work while I hung out with kiddos. I hauled everyone to Amazon park where they were surprisingly happy and polite. We got muddy, ran around in the skate park, and eventually retired to Humble Bagel to carb out. Emma and I made soup until I had to return her in the afternoon. Joanna and I went out for dinner at a Thai place, watching three teen boys bounce superballs in the Oakway Mall courtyard. Good times. Update: Now with skate park footage! My wedding dream: Sadie's hairdresser had fixed her hair with long stemmed roses, with all the leaves stripped off, sticking stright out of her head. She looked like an alien with a lot of tentacles growing out of her skull. Greg was wearing an LL Bean shirt with a number of holes on his right shoulder. It had been mended with iron on tape, which had come loose and was sticking out of one of the holes. I can tell I'm getting old; I just patted Greg's shirt and did not exclaim with dismay at Sadie's coiffure. I thought I'd do an actual update on the family, rather than silly game posts. It's Saturday, though I had to think about it for awhile as the vacation days blend together. I had my fun little medical procedure on Wednesday, and have been taking it easy since then. Joanna's been great, telling me in no uncertain terms that I can't do any work. Laundry has been folded around me, and dishes magically get done. Hanging out with Sam has been equally great, and the two of us have gotten in more co-op video game time than we've had in a year. Emma arrived last night. She was sick during the trip, but otherwise seemed to have a good time. She's still a bit tuckered out, and slept well through the night. As for the rest of the weekend, Sam's going to Jamie's for the day and possibly tomorrow. My mom is coming to watch Emma, and hopefully chat with Duncan who's been wanting some grandma Sue time. I'm hanging out with Jason, BJ, and some others to play D&D of all crazy things, back before dinner. It's definately been a nerdful last few days for me. As for Sunday and Monday, I'm hoping for some kid and Joanna hang-out time. Nothing too exciting sounds wonderful. 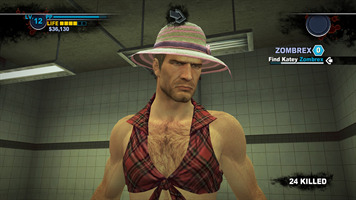 Sam and I finished Dead Rising 2 this afternoon - a silly, bizarre game that was terribly fun while playing cooperatively. I'm not sure I particularly appreciate the story, or the overall tone, but playing with Sam was incredibly fun. I especially liked the gritty cutscenes while wearing my pink hat and plaid shirt. Sam preferred more manly attire. Sam and I have been playing a bunch of different games lately, as he and I were at home all day yesterday. We played some Laura Croft until the controller broke, Left 4 Dead 2, Civilization 5, and Dead Rising 2. Dead Rising 2 has been loads of fun, as we weren't able to get it working earlier. 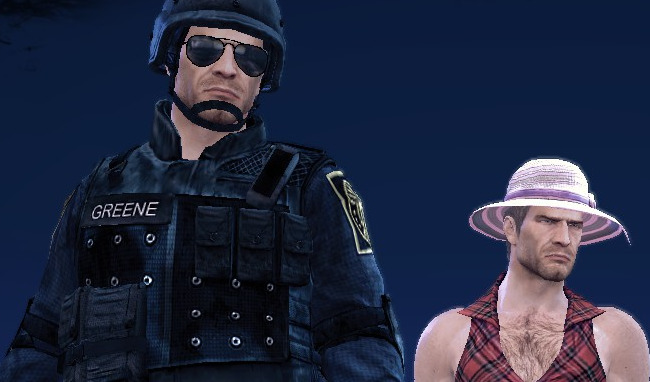 I wasn't sure how putting on clothes worked, so I ended up in a tight plaid shirt and pretty pink hat. Soon enough, I was fighting zombies along side Sam, the hard-as-nails, cross-dressing zombie hunter. Unfortunately we're having a hard time getting coop working today. We're both very sad. It's been an exciting last four days, more an adventure than a vacation. I'll try to quickly summarize. Friday evening was a "date with the kids" night, taking Emma, Duncan, and Berry to the pool to go swimming. We had a great time, with Emma thoroughly enjoying carrying everyone around (myself included). Saturday morning Sam returned, the minivan got loaded up, and we drove to the yurt. The drive out worked well, thanks to technology pacifying the children. We got to the yurt and unloaded, going down to the little lake and beach to play around until dinner time. Joanna went to get groceries and pizza, which we quickly devoured. After that was a campfire and smores, as required for every camping trip. Sleep that night was sporadic, with Emma and Joanna having a really hard time due to strange locations and hard beds. The next morning we had crepes and sausages. I'd made the crepes on Saturday and the yurt had a microwave. The sausages were cooked on a propane stove, with Sam doing most of work, if supervised. We took a trip to the beach, ending up on a strange little beach sheltered by massive boulders. 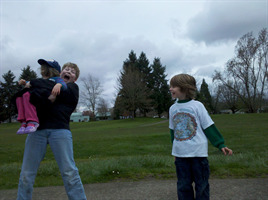 The kids had a great time, despite the rain and cold. Eventually we rounded them up and returned to the yurt for lunch, more packing, and the drive home. I think everyone slept well that night, Emma and Joanna especially. I had Monday off work and spent as much time with Emma as I could before her California trip. She had a great time playing with Berry and Duncan. I broke out the old microscope and hooked it up to the computer for a science experiment involving paper. Theoretically it's for Duncan, but Joanna seems the most excited. After Emma went off, I watched kids until Collette arrived. We tried to play with water balloons, but were foiled by hail. Sam and I managed to play some video games in the afternoon. It was immense fun, and I appreciated his sacrifice so that I could escape from the zombie horde. Our wedding checklist does not have an "in progress" check box, but I feel good about my weekend work even though nothing is close to done. I measured, cut, and sewed 7 white tablecloths, so we now need to beg, borrow, or steal only 3 more 6 footers for a complete (very eclectic) set. I made 40 name buttons for guests, so no one ever calls Seraph Sara on my watch (this does not seem to bother Seraph, and she's a better person for it. But I will go crazy on anyone that drops the part of her name that makes my sister an f-ing angel). 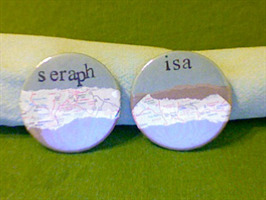 This is a terrible picture, but Isa and Seraph have a remnant of a vintage map of northern NM on their buttons. And I recovered from a few career and academic setbacks, mostly through the company of friends and a phenomenal Smith College bulb show. Sam is now 5' 6" tall, and wears pants with a 30 waist and 32 length. He tried on one of my pants and other than the length, it fit him just fine. It's been interesting watching him grow so big, so quickly lately. And it's not just physically - I've noticed quite a bit of intellectual development since he started Roosevelt. And the other thing - after nearly a decade of having it be a primary ingredient in all his snacks and meals, he no longer loves peanut butter. 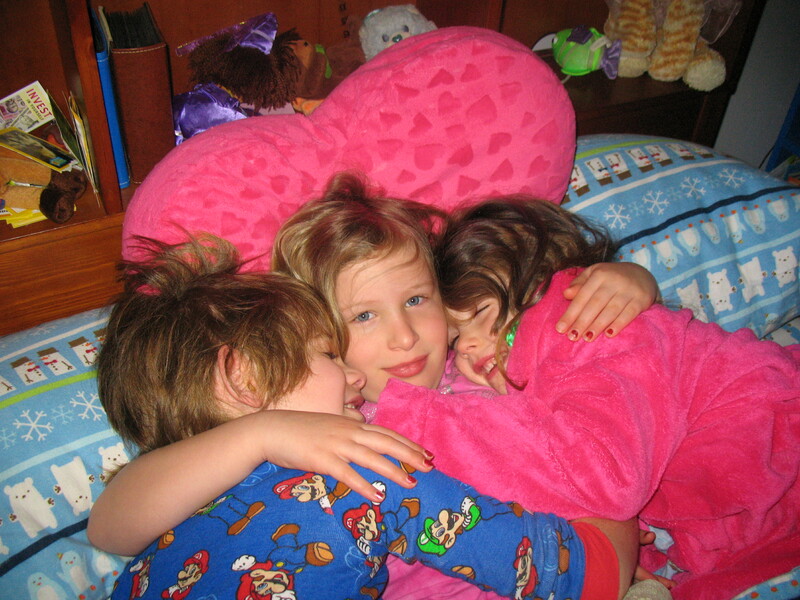 Emma and Duncan got to wear their PJs to school today, which was quite exciting for all involved. I'm stuck with jeans and a Green Eggs and Ham t-shirt, which will have to do. It's been a fairly busy week. Wednesday we had a potluck at Berry's school. She cried all the way there and back, so everyone else went in while I waited with her in the minivan to calm down. Such is the joy of being a parent-like person. Relatively soon we went in and joined the party. Joanna got to chat with other parents. Sam and I went around trying to read posters in French. Eventually Duncan showed us all the cool toys in his class room, and we hung out there until it was time to go. I took my car in, as it was making terrible noises. It turns out it was going to cost $1,100 to fix, as power steering fluid kept leaking out. The good news is that when I went to pick it up from the nice folks at Wayne's Garage, they noticed my PeaceHealth badge and said that got me a discount. Saved me $100. Even better, it runs nice and quiet this morning. Last night Emma arrived and Joanna made roast beef and cabbage for Saint Patrick's day. After kids were in bed and Sam had done his stair stepping, we sat down to watch Easy A. It was quite amusing, and I especially loved the parents who were incredibly funny. I'm not sure I'll ever be so witty and laid back as a dad, but I'll keep trying. Tonight we have a kid date, taking everyone to the pool. I imagine we'll also pack for the great yurt adventure. I was washing sleeping bags and boiling eggs in preparation. Should be exciting. I got a call at work yesterday, with Emma asking if I could come join her for a tour of Adam's Elementary. I cheerfully agreed, runing home, eating a quick sandwich, taking the tour, going shopping while helping Sam with homework, and collapsing at home to unload groceries and watch Glee. The tour went well, and we had a lot of time to chat with a 3rd grade teacher. They were doing circuits and had made little houses with lights and switches, which was pretty neat. We also stayed for some of the principal's speech. They evidently had a big technology grant with lots of computers and iTouches. There's also a school garden and they're getting solar panels this summer. Emma seemed generally cheerful and I'm glad I could stop by. My car is also in the shop, needing $1,100 worth of repairs. It's been making a horrible noise for awhile, which evidently was the power steering fluid leaking away. My finances continue to be tight, but I think I'll be okay. I'm still eyeing flights back East, and hoping it's not insanely expensive. For the most part, the week has gone well. 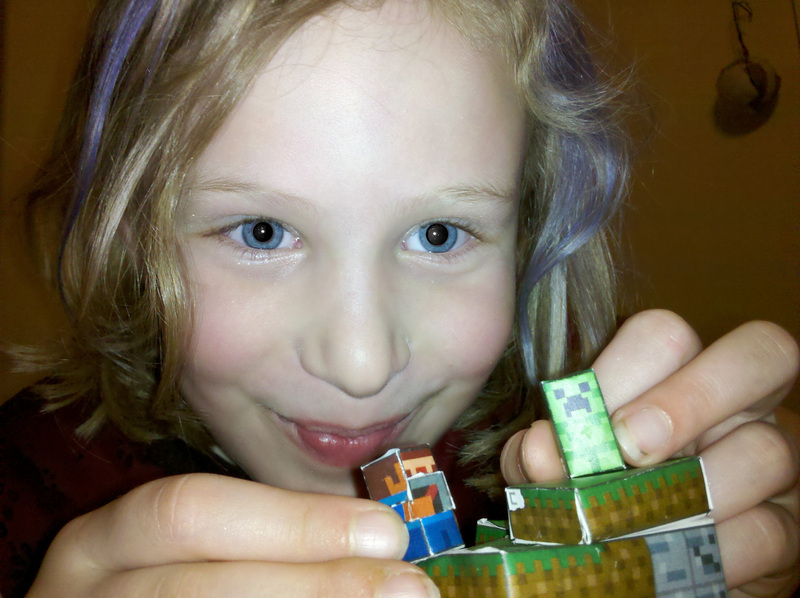 Sam continues his epic Minecraft building projects, cheerfully putting the rest of the family to work. He managed to get himself voted Mayor and controls the local currency. It's all pretty funny. I think we're going to go swing dancing tonight, and there's a potluck at Berry's school as well. Tomorrow Emma returns, Friday is a swimming night, Saturday is our coast trip, and then it's Spring Break. Sam was enthusiastic about my suggestion of leaving him in front of the computer with a stack of sandwiches when I left for work. He'll only be by himself for a couple of days, so perhaps I'll indulge him. It was a quiet, pleasant weekend all around. Friday night Joanna and I went out to Willie's at the Campbell House for dinner, which was quite tasty. The next morning was filled with Minecraft and pirate paintings, then off to the library with the smaller kids. Joanna worked away at her school project, and then we scooped her up to go to the U of O art museum. They had a free museum thing for kids, and we constructed things out of recycled materials. Next was a puppet show which was fairly amusing, and we wandered back home for quiet time. Emma and I managed some work on her math game and homework. Sam had returned, and we hung out for awhile, watching Doctor Who after a pizza and Rough Science evening. Sunday we mostly stayed home, playing and working on projects. The weather was gorgeous briefly in the afternoon, so we went outside and played with hoses and water guns. Victoria was out with Flynn and Sebastian, so all the kids ran around for awhile. After an hour or so, the rains came and Joanna took the younger kids to Target. As soon as they returned, we drove over to Jenny's to eat dinner with her family and dad. It was pleasant and low-key, with Sam playing this 3D Connect Four game the entire time and Emma and Jordan laughing away while playing a Zelda game. Everyone was pretty groggy this morning due to daylight savings time, but we made it to school and work without too much difficulty. I forgot my logon password so it took me 4 feable tries until I could find the password..sigh. .I may have to tatoo it on my wrist for the future. Josh said they are all well on Oahu. Many of the harbors in the other islands were badly damaged from the tsunami including one in Honolulu. If he had his old job (clean water) he'd be out testing water samples. In his new job his agency monitors air quality for radiation and he also checks radiation levels for dental xrays machines, etc.. My heart breaks for Japan and the people who lost their lives and homes. I think we traveled through Sendai 4 years ago. It's hard to believe most of it has been washed away. Thanks for thinking about Josh and the family. I awoke to the news of the tsunami, immediately going through my list of people who live on the coast and worrying about them. I called dad at six thirty and confirmed he and Anna were okay. It's challenging for her, as Anna runs an assisted living facility and you can't really move patients very easily. Fortunately I'm hearing that the waves hit and weren't very bad, nothing like Japan. To top it off, construction hit a gas line near work and driving in took forever. The smell of gas was in the air, and I opted not to go to Starbucks with Mike this morning. So much for our man date. Sam made it to work yesterday, tired but feeling better. He's pretty much caught up with homework and generally good to go. I expect to see him tomorrow afternoon after a visit with Jamie tonight. 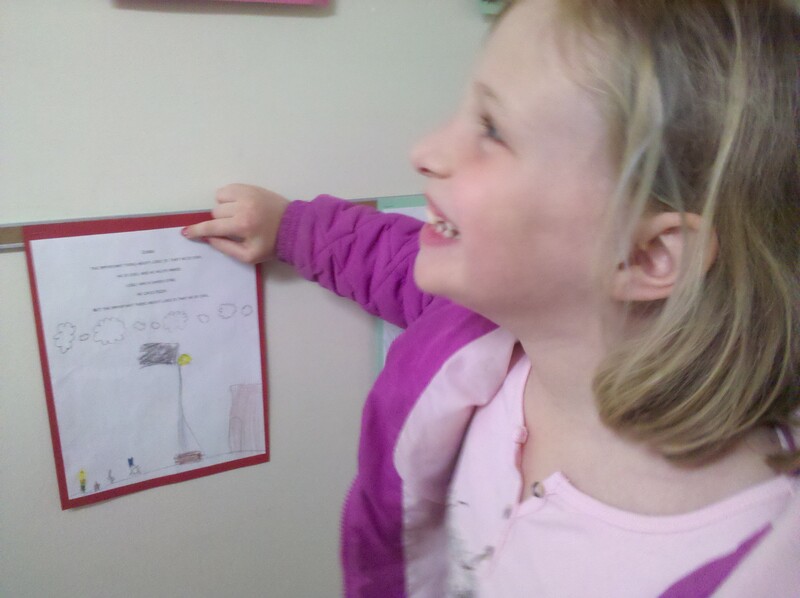 Emma arrived yesterday and cheerfully requested I create homework for her to work on. I made up Adventurer Bob and Adventurer Sally math problems for her enjoyment. Joanna and I are going out to dinner tonight, and tomorrow we're hoping to visit the art museum for art projects. Emma's friend Kate is coming for a visit. Joanna has a web site she needs to finish for school by Sunday. We'll likely do pizza and Rough Science Saturday night. I'm sure we'll fit in a library trip in there somewhere, and probably a trip to Target. Sam needs pants again. The kids refuse to stop growing. As usual, life is full of disasters, but generally happy. 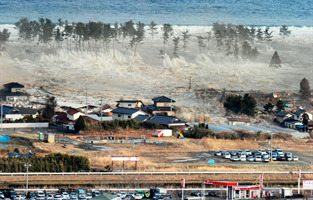 Yayoe - I just read about the tsunami waves hitting Hawaii. Would you please let us know if Josh, Jody and the boys are ok? Sam seemed to make a recovery last night, and was cheerfully laughing and watching Glee with us. We managed to find his binder and get his homework collected, which he's hopefully picking up this morning. Unfortunately he didn't sleep very well last night and was pretty groggy this morning. Hopefully he'll be awake enough to find his way to school. It's mostly downhill. Sam and I are home sick today. Duncun's school called Joanna, and fifteen minutes later Sam called me. Unfortunately Joanna and I had carpooled, but my nice coworker Dave drove me over to move kids about. Sam was sporting a mild fever and took it easy for most of the day, sleeping off and on. I was feeling a little under the weather this morning, as was Sam. I fed him and sent him downstairs to read and rest for awhile. We're now both on our computers, me working and him playing. I figure I'll let him revel in playing Oblivion for a while longer before making him do math or something equally horrendous. I'm back to work, muddling my way through the little issues that have built up and trying to debate if it's time to dust off a big, old project I set aside long ago. Friday night we stayed home with kids, as our babysitter was away. Joanna and I watched Juno, which was remarkably good and witty. The next morning was a mix of computers and art projects. Minecraft papercraft was constructed, with Joanna feverishly cutting and gluing tiny figures. I took the kids to the library so Joanna could work on her school paper. The hope is that she graduates next term if all goes well. In the afternoon we went to the Science Factory, spending a remarkable amount of time in a large room filled with science. Everyone liked the carbon dioxide and water-vapor bubbles, which popped dramatically in your hand. After the toy exhibit we returned home for quiet time and a low-key dinner. Sunday began again with computers and art. After breakfast Emma declared that we'd be going to the shed for school, with Joanna cleaning the chicken coop. We read and did a little math, heating up the tiny room with a space heater. Emma slipped out to talk to Morgan and play Sims 3. They were overheard complaining about pregnancy and how hard it was to get anything done with toddlers around. We went to the park and ran around, with everyone practicing their bikes at least a little bit. Emma was proud of herself for being able to finally climb the cheese, practicing over and over. I lifted up Berry and Duncan repeatedly onto the cheese, occasionally pretending to remove their head and limbs to their delight. We had our family dinner night, and it was nice to see Yayoe after a long absence. Emma charmed everyone, as usual. Sam arrived later that evening, and I realized just how much I'd missed him. The weekend ended with part two of a Doctor Who episode. Sometimes the simple things are best. 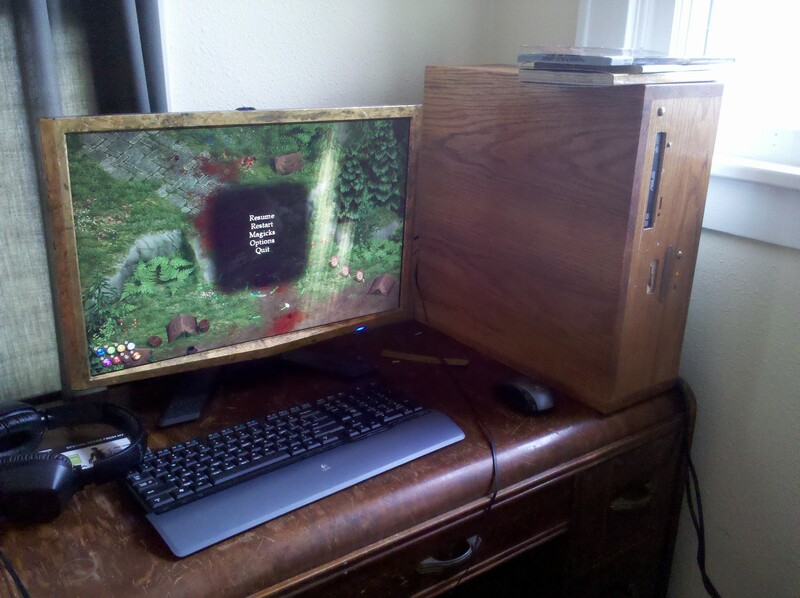 Many years ago, my dad and I worked on a beautiful wood and brass case. It was handed down to Sam and then Emma, and finally the innards were so old that the case sat on a shelf for a couple years. It felt good to break it out again when putting together my new computer. I ordered the parts a couple weeks ago after my tax return arrived. It's a six-core AMD processor coupled with a GeForce 560 Ti video card. I also have three different drives in there, a fast main drive, slow big drive for media, and tiny super fast SSD to install my current game. It's amazingly smooth, all around, and I really like the SSD's ability to reduce load times to nearly nothing. Hopefully it'll serve me well over the next couple years. Putting it together went fairly well. I managed fifteen minutes here and there to screw in motherboards and stick in memory. Saturday morning I screwed up my courage, turned it on, and cheerfully started installing Windows 7. By the end of the day I was playing Magicka and getting things configured the way I want. It's nice when things go without a hitch. So your like, almost 40 now, right?? I walked across the street to get a mocha with a coworker this morning. We continue to talk about jobs and moves and such. I don't feel particularly stressed, though it's on everyone's mind. We had fun going to Roosevelt last night to hear Sam sing. I left work a little early to get dinner ready so we could get there on time. Tonight Sam goes over to his mom's, though I'm going to try to play Magicka with him online sometime. Our babysitter is busy, so it'll be a quiet night alone with kids. Perhaps we'll do a movie or something equally low-key. Nothing particularly exciting is happening. Joanna has a paper due on Sunday. I continue to work on building my new computer, which is nearly to the point where I can turn it on. Then it'll be a matter of running network cable under the livingroom floor and installing everything. I'm starting to get excited to see how well it works. Sam performed his songs from choir last night at Roosevelt. I somehow got assigned the job to open the door for late kids, and then wandered into the gym to watch the full performance. It's been fun watching Sam get into his new classes. Yesterday he and some others put on a play they made up, and he was disappointed they didn't get to finish. This is the one where he got to play the big, dumb older brother. He's also making good friends. This morning I reminded him to take in his Magic deck to play against Jordan. I've yet to get Sam to invite Jordan over for a visit. I think the two of them would have a good time hanging out over the Summer. I just finished my morning run, waking up a little after five. My sleep has been lousy the last couple nights. No headache today, just scary dreams with my coworkers woven throughout. Breakfast is soon, and then morning meetings followed by a drive back home. We have our final swing dance lesson tonight. Hopefully it's not too hard to peel myself away from kiddos. I've missed my family. It's been an interesting visit. My impression of the job move date is that it's many years from now. I also get the sense that many people will stick around, but few people want to move. That's my plan so far. And who knows? Maybe they'll find some way to keep me around. Then again, a ride down the hill to the U of O, coupled with tuition breaks, sounds very appealing. I finally put together a video of last weekend. Both Mardi Gras and Splash! were really loud, so turn down that volume. Hi, we have the following reservations at the Canaan Motel. Each room has two queen beds.Yayoe/Danica, Lohring/Anna, Adam/Emma, Jenny/boy or boys, Sue/Bob. Seraph, Robbie and Isa will camp-out at the farm - Jordan, Emma and Isa will probably move about. Yayoe is taking a red-eye from Portland on Thursday night; John isn't going. Bob and I will probably fly East on Tuesday and back the next Tuesday, trying to sightsee a bit with whichever grandchild/ren are around. I didn't realize we were so close to the Coast. I'm up in Vancouver at the moment, typing away in my hotel room and waiting for breakfast to start. The drive up was fairly painless, riding along with a couple coworkers and stopping by Fry's on the way. They nicely dropped me off before going to Famous Dave's BBQ, as I was hoping for something more than salad. We took a tour of SouthWest yesterday, which seemed notable for all the beautiful artwork. Their IT staff was interesting, very barebones with no real developers. Evidently a decision was made to outsource everything. The end of the conversation was amusing, as we talked about how many of the people on our team weren't going to move to the new shared services center and they asked if telecommuting was possible. We all laughed and the current telecommuters raised their hands. That night we went out to dinner where there were two vegetarian options. I had been sporting a headache since lunch, possibly because of a hard run or maybe because a cold caught up to me. I got through it, enjoying the exuberance of a couple coworkers who had downed a fair number of cocktails. I was in my room by eight, where I Skyped with Sam and helped him with homework until ten. It was fun, and we kept singing little bits from a Just Dance 2 song, mangingling the lyrics and asking if the funk was so rubber. Let me do a weekend post now, and back date it so it looks like I'm really on top of things. I have some great video from Splash!, but I'm not sure my poor little netbook can handle video editing. This is a fairly late weekend post, for a fairly exciting weekend. Friday night Emma, Berry, Duncan, Joanna, Collette, and I went to Mardi Gras at Duncan's school. It was a mad house, with everyone stuffed into a couple big rooms due to the intense cold outside. The little kids loved winning prizes. I hung out with Emma, won a few things, and watched her get crazy hair. I think she had a good time. Saturday morning was our traditional Minecraft and breakfast combo, with crepes and a mocha for me. We also broke out the art supplies, doing a bit of drawing before a library trip. Joanna worked on homework while I took the kids out. Emma got Duncan hooked on Johnny Boo books, and he can now read them himself. After a bagel and second mocha, we headed home to find Sam returning from his mom's. There was plenty of laziness and relaxation to go about. Sam continued his secret city in Minecraft, telling people where it is for the price of 500 blocks or indentured servitude. I paid off Emma's contract, though she still wanted to help. Duncan was sent to the quarry to get stone, excited to have a project. I explored nearby caves for treasure and supplies for Joanna and I to build our little house together. Such a funny way for a family to come together. Emma kept me company for a grocery store run, pleasant and funny as always. We had pizza and watched Rough Science, our preferred show while Mythbusters is on haitus. Sunday we went to Splash!, as requested by Emma. It was challenging keeping an eye on everyone, and Sam wasn't thrilled about going, but it was good exercise for all and we returned home exhausted for quiet time.